Let’s hope not. I’m writing to you now from about 20,000 feet, or whatever height Ryanair cruise at. Alas, due to flight schedules, the three of us who departed Dublin at 6am on Friday, Padraic, Derek and myself, are now homeward-bound on Sunday morning. Only David and Lorcan remain in Tartu to wear the green jersey in the Pairs event. Day 2 in Tartu (assonance?) was a very busy one for the Irish competitors. It began at 10am with the Individual Quiz, in the main hall. Anyway, I outlined how we got on in yesterday’s post so let’s move on to the afternoon’s exciting event: Ireland’s first foray into knockout quizzing. After the qualifier round of the Nations Cup, the top eight teams play out semi-finals (as in, 1-4 go for the main title and 5-8 try to get to the Plate final). Similarly, the top eight teams in the Aspirational Cup (B teams etc and ad-hoc teams) have semi-finals and I actually got to MC one of these on Friday night. This is a bit of an anomaly but the teams who finished 9th and 10th in the Nations Cup qualifier also get to have a knockout quiz. This year, these teams were Germany and Ireland. Germany got a wee bit of a boost beforehand when one of their four players, Holger Waldenberger, only went and won the Individual quiz title, in very exciting fashion, pipping Estonia’s Igor Habal on the last question! Suddenly we felt we may be up against some significantly heavier hitters than we had anticipated. That said, we got off to a bit of a flyer, scoring full points in topics such as ‘Women in Video’, ‘Women Directors’ and ‘Beautiful Education’. We also stole a few bonuses off our opponents, particularly in the ‘Ireland’ category, which they cunningly picked just before the questions went from being worth 2 points to 3 (halfway through). After seven rounds we were 43-29 in the lead and things were looking rosey. However, a terrible turning point arrived when we decided to pick a category called ‘Party Time’. The famous Mardi Gras carnival in Rio is only open to participants who are professional dancers. If one wanted to take part in a Mardi Gras parade one can go to which city in the state of Bahia? Started in 1946, this annual festival sees which small Spanish town, near Valencia, being covered in tomatoes? Going from May to July each year, which art and culture festival of St Petersburg, Russia, has now spread to several cities worldwide? Alas, dear reader, none of the Irish team members knew the answer to any of these questions. Worse, Mauro on the German team is clearly a fan of the festival circuit as he answered all three of them. As I’ve said, at this point answers were worth 3 points, so this gave Germany 9 points on what had been our round. Following this boost, they never looked back and took the lead during the next round, which was their choice. In our final round, we did have one moment of light relief. All that was left were ‘Baltic Heroes’ and ‘Butterflies’ so we plumped for the former. It was made up of three questions on medal-winners at the 2012 Olympics who all hail from Baltic countries. The first of these included a picture of a discuss thrower from Estonia. Not having a bull’s notion of his name, we gambled on the fact that he had a name clearly printed on his meet bib. “Is he called Kanter?” I answered with a question. In the world of competitive quizzing, surnames are generally sufficient. Add an incorrect first name onto a correct surname and you penalise yourself, as the answer will be marked as wrong. 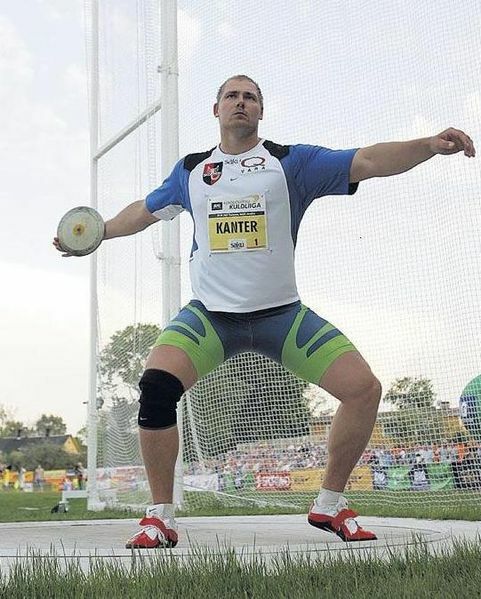 Estonia’s best discuss thrower is not called Karl ** so, if I had said that name, I was wrong, and the name on the jersey wouldn’t matter. Indeed, it would certainly have meant that our opponents would have stolen the bonus points. Thankfully, sense prevailed and they realised what I had actually said. It didn’t matter in any event as our knowledge/luck ran out there and we could not identify the remaining two athletes. Off to dinner we went and I had a lovely time chatting to Leslie Shannon, an American who now represents Finland, where she lives with her Finnish husband and two children. She is a former champion on famous US TV show Jeopardy! and we even loaded up youtube on my phone during the dessert course and relived one of her victorious shows from the early 1990s. It’s amazing who you meet at events like these. Another person I got to meet was Maj-Britt Christensen, a Danish quizzing star who Jakob, our table-mate from the morning’s quiz, had lined up for our team in the Team Quiz. If you remember from last year, the Team Quiz is just like the Nations Cup except the teams don’t need to represent a country, and thus can be created via mixing and matching of friends etc. Lorcan had been head-hunted by Sebastian, the captain of the German team, for a wonder-group which also included Igor Habal, who was so close to lifting the Individual crown, and Mark Ryder, the top American quizzer at the EQC. And you thought we had to travel for this event. 🙂 They did much better than us, albeit performing more like Anzhi Makhachkala than the Marseille team of the early ‘90s, and ended up in 7th place. I look forward to next year when Seb head-hunts someone to take his own place in the squad and then leans back on the hind legs of a chair and admires the team he now manages, as they take the title. I hadn’t seen any of the fun quizzes which so enthused me last year so, after about 30 minutes of rubbing shoulders with such quiz glitterati, I bade them farewell and set off for Café Nalg, the venue for the night’s informal gathering. All I found in Nalg though were most of the German team, no doubt celebrating their 9th place finish with fervour. Holger (the other one) was there and he informed me that the organisers of the Asian Quiz had decided the Nalg was too crowded and relocated it to …. the lobby of my own hotel, The Dorpat! So home I went, arriving midway through the quiz. I joined up with Leslie on her team, which also included Belgian quiz supremo Steven de Cuester, and we ended up with a worthy-looking score of 22/32. Was this good enough to win? Well, it turned out the event was so informal that the hosts had no interest in how everyone got on! So I don’t know either. Readers from last year may remember my going on and on about the Belgian’s buzzer system and the Quiz Bowl. Well, there it was on the table in the lobby and I inveigled my way onto one of the buttons. Tom Trogh was in charge and he asked questions from an expansive set of questions on his laptop. Chris Jones, of the International Quizzing Association, was on this side of the questions for once as he sat beside me and took part. Also on my side of the table was Dorjana from Croatia, twice a finalist on the BBC’s University Challenge. This is what this event is like. You can quiz all day if you choose. Due to our early morning departure, I drew a line in the sand at 2am and headed up to bed. I could have kept going though…. Well done to the organisers. I’m already looking forward to EQC 2013. Let’s hope it’s somewhere warm though! Update: I’ve just found out that Lorcan Duff and David Fay finished 16th in this morning’s Pairs event. That’s out of over 70 teams so well done boys! * The word you probably know already is icon(s). ** His first name is Gerd. 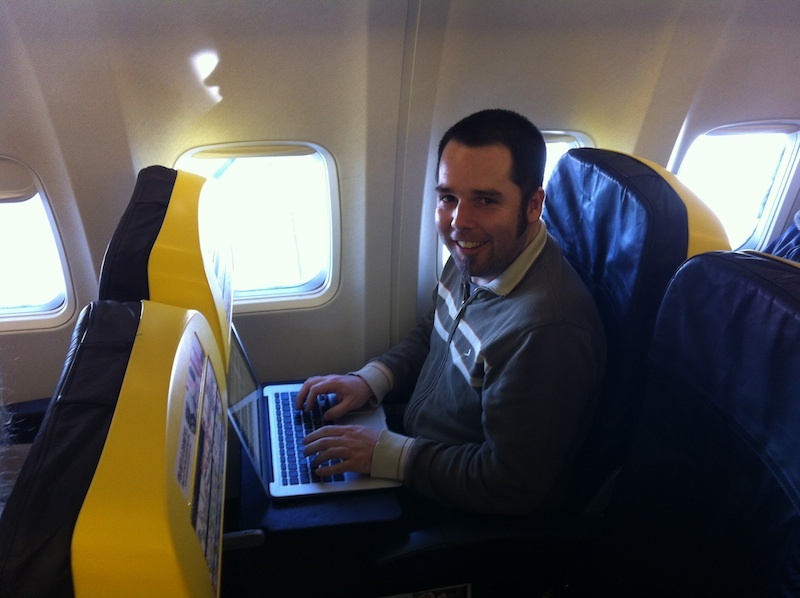 0 responses to Mistakes on a plane?